Via intelligently identifying any connected device, Smart IC delivers the optimum, high-speed charge to all USB devices. If you have any questions, please kindly contact with us. Smart Charging Technology:☀4 Port USB Charger have strong compatibility and stability, matching the best current with iPhones,Samsung,HTC,LG,Optimus,Nexus,Motorola,Blackberry,Amazon Kindle Fire Tablet,Xbox,Bluetooth speaker,Google,Huawei and more. Product design:☀Smooth and strong appearance, Unique mobile phone bracket design are more conducive for your mobile phone charging. The power cord is longer enough to use at living room or office. The USB charger station also has 4 rubber pads at the bottom in order to ensure stability even when using all 4 USB ports. Products features:☀4 USB charging ports to ensure the fastest charging speed and charging 4 devices at the same time. 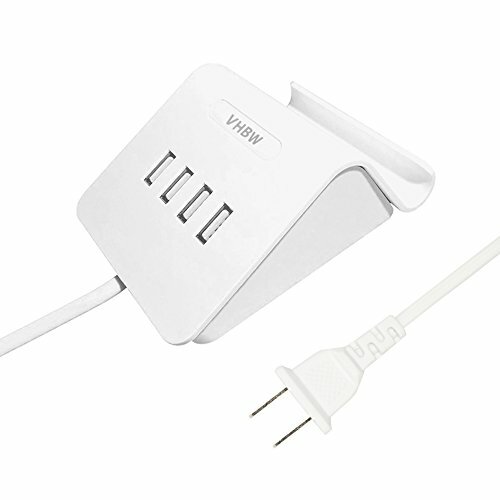 Input:worldwide 100-240v 50/60HZ Output:5V 3.1A with 5.3Ft Power cord enough to use. iSmart technology provides a safer and higher current conversion for charging. Security protection:☀All products are CE FCC RoHS certified for safety. Premium components facilitated by over-current, over-charge, over-load, short circuit and over-temperature protection safeguard your devices. Warranty:☀Tedadaptor Provides 30 Days Money Back Guarantee and 24-month Worry Free Warranty. If you have any questions about this product by VHBW, contact us by completing and submitting the form below. If you are looking for a specif part number, please include it with your message.